"In all my years of going to Civil War events, this was by far my favorite. These men absolutely made the Civil War come alive with their portrayals of the generals." "The Annual Gathering of Civil War Eagles" in Winchester Virginia was the place where the Nation’s most prominent impressionists of Lincoln, Grant, Davis, Lee, Longstreet, AP Hill, Ewell, Sherman and many others engaged in debates throughout the weekend and offered themselves to you for those questions you've always wanted to ask. 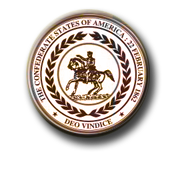 The "Gathering of Civil War Eagles" was not just a seminar of authors and others who have read of the many exploits of the contest, but instead a seminar of learned individuals who bring the characters to life, with participants asking questions that only they can respond to appropriately. Held in the original 1840's Winchester Virginia Courthouse in beautifully restored downtown Winchester added to the feeling of being transported back into time.